No sooner had Joey Muthengi quit Citizen TV than she landed a new job in the United States. Ms Muthengi, who is said to have fallen out with the Royal Media Services-owned station over her partnership with bookmaker Betin, has landed a gig with Voice of America (VoA), an international radio station in Washington DC, United States. It just so happens that Joey Muthengi interned at the US government-funded international radio broadcast while she was still in college. 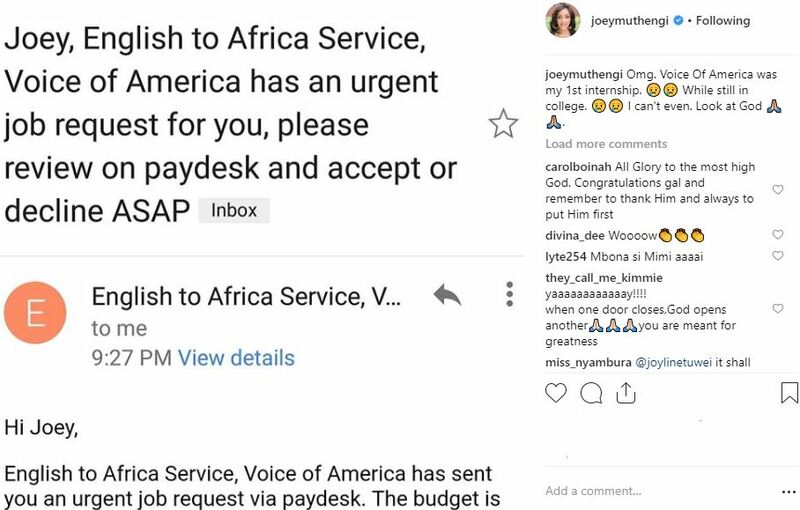 An elated Joey could not hide her joy and shared the good news after receiving an email from VOA English to Africa Service. In 2001, the Voice of America launched a 24-hour FM frequency in Nairobi broadcasting from Washington DC via FM Station 107.5. VOA’s English to Africa Service provides multimedia news and information covering all of Africa.